Once again, Florida’s elections made national news. I assume you've seen the results (click here for the state’s and here for Collier County’s), so in this post, I’ll dive a little deeper. First, I’ll share my thoughts about their implications for public policy and for the people of Florida. Then I’ll briefly comment on the results of the local races I wrote about on Sparker's Soapbox. 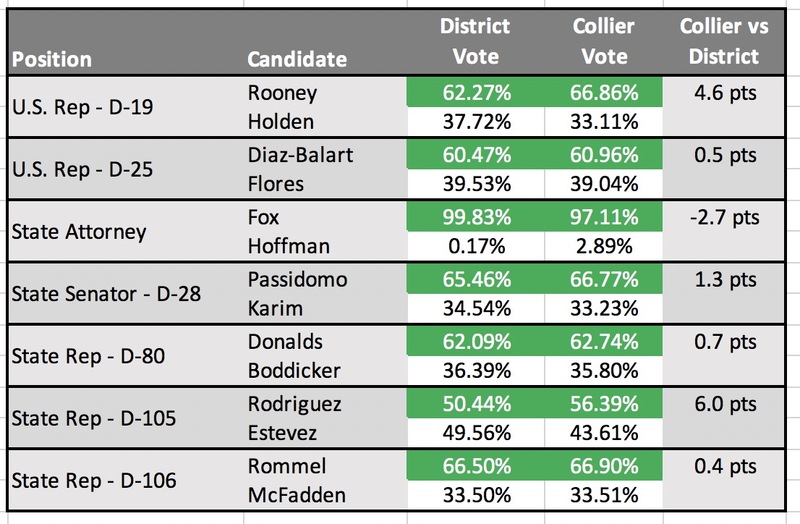 Finally, I’ll point out significant differences between how Collier County voted and the state- or district-wide results to show Collier County in a broader context. My goal is to give you a deeper understanding of our midterm elections — what the results say about Collier County, and how they might affect our local and state government, both now and in the future. And with this understanding, I hope you'll want to continue to read Sparker's Soapbox in the months ahead. Why? Because if we don’t monitor what our elected officials do and don’t do while in office, we won’t be informed enough to reward or hold them accountable come the next elections! The outcome of the federal elections has been the focus of much recent attention as what some are calling a slow-moving Blue Wave gave the Democrats control of the House, gaining 37 seats as of November 17. (But see So, Was It A Wave?) But the two Democrat pickups in Florida (the Miami-area’s District 27 and south Florida’s District 26) were not enough to flip the state’s congressional delegation. And after a manual recount, Florida Democrats lost a U.S. Senate seat to Republican former governor Rick Scott. At the state level, Republicans won the governorship, two of the three Cabinet seats (Democrat Nikki Fried won the Commissioner of Agriculture race following a manual recount), and the majority of the Legislature. So there will be a continuation of the agenda that outgoing Governor Rick Scott, House Speaker Richard Corcoran and Senate President Joe Negron championed. Their successors will be Ron DeSantis, Jose Oliva and Bill Galvano, respectively. The 2019 Florida Legislature will look much like it did in 2018. While Democrats picked up six seats in the House, Republicans retained control of 73 of the 120 seats, or 61 percent (see here). In terms of policy, of note is that incoming Speaker Oliva has named Rep. Jennifer Sullivan to head the House Education Committee. She has been an ally to conservative education groups and their concerns, championing home schooling and tax credit scholarships in previous Legislative sessions. In addition, Oliva named Rep. Travis Cummings to chair the powerful Appropriations Committee. He was one of 67 legislators to pass the Marjory Stoneman Douglas Public Safety Act as a standalone bill in the 2018 Session, and in the 2013 Session, he sponsored a bill that narrowly expanded Medicaid under the Affordable Care Act. In the Florida Senate, too, Republicans retained control. In the 2019 session, they will hold 23 of the 40 seats, or 57.5 percent. Democrats picked up one seat and will hold 17 seats, or 42.5 percent (see here). Incoming President Galvano has not yet named committee leadership, but recently said he wants to consider changes to the election laws in view of the issues that arose during the unprecedented three state-wide recounts. Regarding Amendment 4, which restores voting rights to former felons, he said that while some aspects might require legislative implementation, lawmakers would not “slow-walk” putting it into statute. At the local level, incumbent Penny Taylor was elected to a second term on the Board of County Commissioners. With no change in Board make-up, expect a continued focus on the Board’s current priorities and issues. 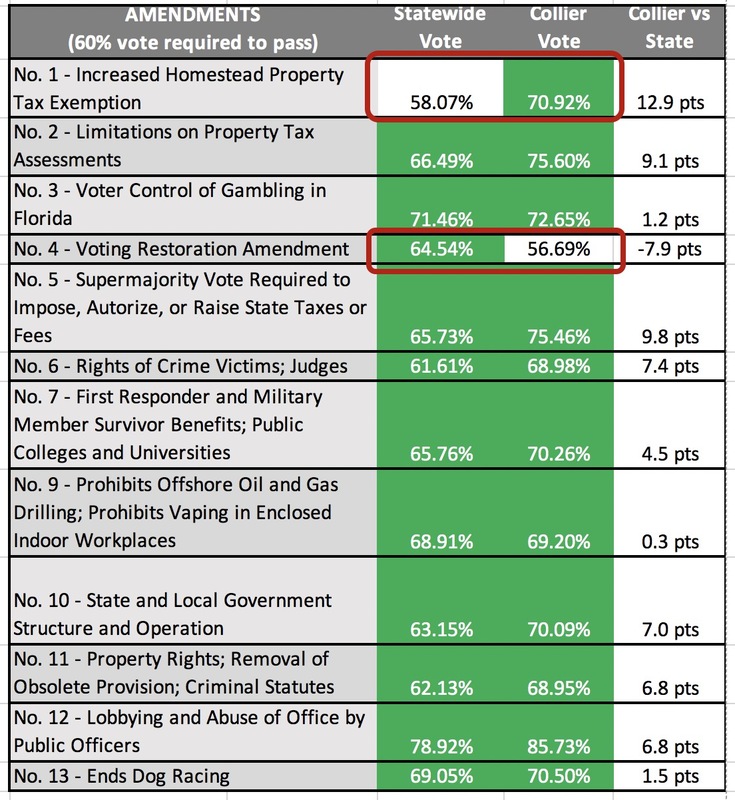 Only one of the twelve amendments — Amendment 1 - Increased Homestead Property Tax Exemption failed, receiving two points less than the required 60 percent of the vote. The eleven that passed have varying effective dates. Amendment 2 - Limitations on Property Tax Assessments — The Legislature’s Revenue Estimating Conference estimated that passage would result in a loss of property tax revenue to Florida’s cities, counties and other taxing authorities (but not school districts) of about $688 million in the first year alone, and about $700 million annually. Local governments will have to find other funding sources or cut spending as a result. Amendment 4 - Voting Restoration Amendment — Beginning January 8, 2019, an estimated 1.4 million currently disenfranchised Americans will be eligible to vote. Given the closeness with which current races have been decided, this could have a significant effect on future elections. 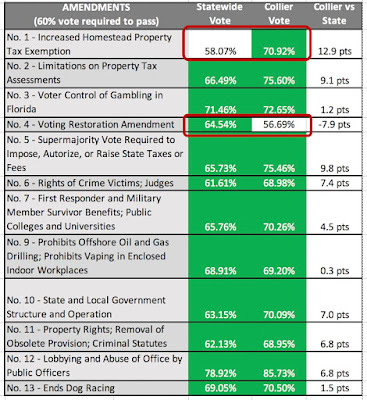 Amendment 5 - Supermajority Vote Required to Impose, Authorize, or Raise State Taxes or Fees — It will be much more difficult, if not practicably impossible, for the Legislature to raise taxes going forward, regardless of how future recessions affect property-, sales- or other types of tax receipts. Since the biggest areas of spending in the state budget are healthcare and education, passage of this amendment concerns me greatly. Amendment 6 - Rights of Crime Victims; Judges — This amendment, which adds five pages of victim’s rights to the state Constitution, “will either be the greatest expansion of victims’ rights in Florida history or upend the criminal justice system as we know it, depending on who you ask,” wrote The Florida Times-Union. Its actual effect remains to be seen. Amendment 7 - First Responder and Military Member Survivor Benefits; Public Colleges and Universities — The unfunded mandate enshrined by this amendment on state and local governments could be significant, but as of now, its cost is unknown. We’ll find out after it becomes effective next July 1. Amendment 9 - Prohibits Offshore Oil and Gas Drilling; Prohibits Vaping in Enclosed Indoor Workplaces — Offshore drilling is now permanently banned, creating a higher level of protection for, and enshrining the value of, Florida’s natural resources in the state constitution. Amendment 10 - State and Local Government Structure and Operation — By 2024, every county in the state will be required to elect five specific local offices: sheriffs, clerks of court, tax collectors, property appraisers and supervisors of elections. The effect on Miami-Dade, Broward and Volusia counties, which are currently the only ones affected, will be significant. Amendment 11 - Property Rights; Removal of Obsolete Provision; Criminal Statutes — This amendment allows the Legislature to retroactively apply new sentencing guidelines to prisoners currently incarcerated. If they do, it could result in earlier releases and possibly reduced expenses to the state. Amendment 12 - Lobbying and Abuse of Office by Public Officers — With the overwhelming passage of this amendment (at 79 percent, the highest approval rate of the twelve), state and local officials are banned from lobbying for six years after they leave office. Opponents feared the lengthy restriction would keep otherwise willing people from running for office — an unintended consequence that remains to be seen. Amendment 13 - Ends Dog Racing — Nearly 8,000 greyhounds need new homes and hundreds of race track employees will soon be looking for new jobs. About 8.2 million votes were cast statewide; Collier County represented less than 2 percent of them. Here, 157,097 ballots were cast. County Commission District 4 — Incumbent Penny Taylor was challenged by Democrat Gary Petit-Dor. Unknown Petit-Dor received 30 percent of the vote, which was surprising; Taylor’s win was not. Mosquito Control Seat 1 - John Johnson will return to the Commission after his defeat in 2016. He won with 48 percent of the vote in a three-way race with Victor Dotres (29 percent) and Dennis Sanders (22 percent). Mosquito Control Seat 2 - Sandra Lee Buxton received 76 percent of the vote, crushing challenger John Shuey (24 percent). County Judge Group 2 - Blake Adams narrowly defeated Jim Moon by just 102 votes in a race that was ultimately confirmed in a manual recount. Each candidate received just over 57,000 votes; over 42,000 people left the race blank, a 27 percent undervote. The sales surtax - Surprisingly, given the conservative nature of the Collier electorate, the sales tax narrowly passed with 50.87 percent of the vote, a margin of 2,498 votes. 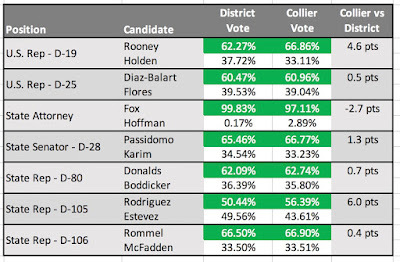 It’s no surprise that the majority of Collier voters overwhelmingly chose the Republican candidate in each of the partisan races on their ballots. Collier County has been dominated by the Republican Party for some time. 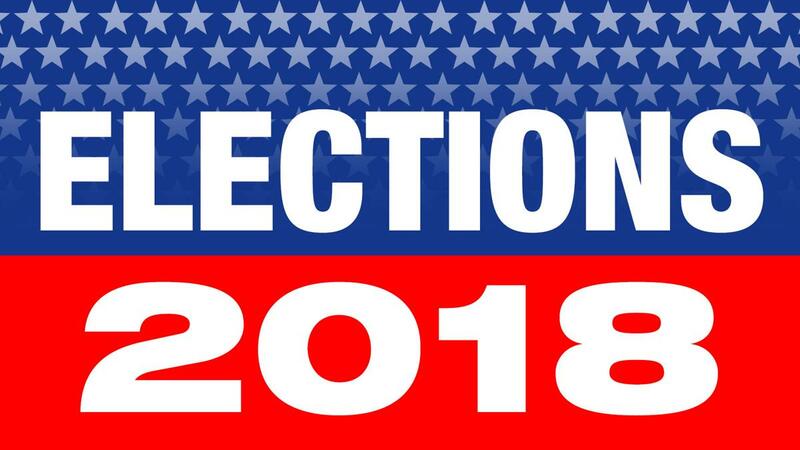 As of the official book closing for this election, 50.7 percent of Collier voters were registered as Republicans, 23.8 percent were registered as Democrats and 25.5 percent were all other, including No Party Affiliation. For the state as a whole, 35.4 percent were registered as Republicans, 37.2 percent as Democrats and 27.5 percent as all other, including NPA. In state-wide races, the results were much closer for the state as a whole than they were in Collier County; the margins in three of them — U.S. Senator, Governor and Commissioner of Agriculture — were less than 0.5 percent, necessitating a recount by state law. 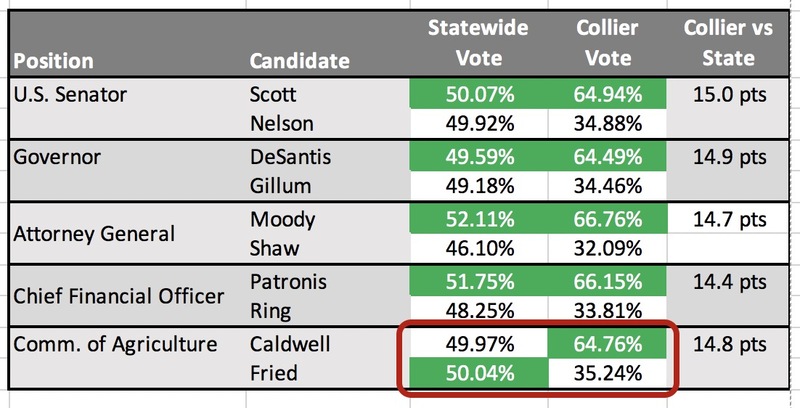 Note the significant difference in the Commissioner of Agriculture vote, which went to the Democrat after a manual recount, but which overwhelmingly supported the Republican in Collier County. On the amendments, also not surprisingly, Collier voters more strongly supported those that gave them more tax benefits (Nos. 1 -- which did not pass -- and 2) or limited future tax increases (No. 5) than did voters state-wide. 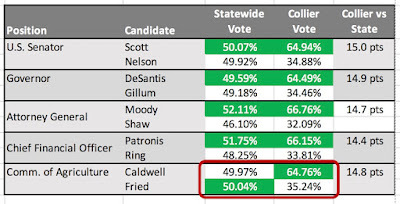 Another significant difference between Collier and the state-wide results was the eight-point difference on the amendment to automatically restore voting rights to former felons (No. 4). Had Collier’s 57 percent favorable vote rate been mirrored statewide, the amendment would not have passed. In district-wide races, the Collier vote was much closer to the vote of the district of which it is a part, but in all but one case (State Attorney) went more strongly for the Republican candidate. In races that had an incumbent on the ballot, s/he was overwhelmingly supported for another term. So there you have it: my thoughts about the implications of the election results and constitutional amendments, some comments on the results of some local races, and a look at how Collier County voted, but in a broader context. I hope this was helpful ... and thought-provoking. Let me know if I accomplished my goal!